Home→Blog→Resident Centered Dining Service→The #5 Truth About Your Business That You Cannot Ignore! Truth #5: You’re Most Dependent on Your Lowest Paid, Least Trained Staff. Raising dining standards most effectively means training all your staff to shine in the dining room. It does not mean adding a faux palm tree in the corner of the room. 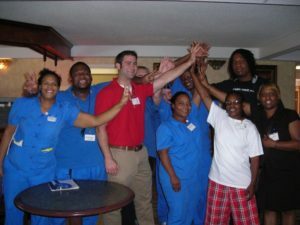 Your servers and ancillary staff are your direct link to your residents. The servers generally come to you completely untrained. Yet you depend on them more than anyone to create a comfortable, but professional, contentment in the dining room. Since the residents find mealtimes the most important, and social, times of the day, it is imperative that your staff is friendly, knowledgeable, and trained to put your best foot forward. The residents who are unhappy with their mealtimes, but won’t necessarily complain, will move to a community that does fulfill their mealtime anticipation. This loss of revenue and the cost of getting them to stay in your community, can be avoided by Kind Dining ® training. When your servers learn to utilize a pleasant genuine greeting with the your diners, they will address them by name, not “honey” or “you guys” showing the respect due to them. Your residents’ appreciation will rise considerably. They will take note of this small, but hugely important detail. Visitors and guests to the dining room will also take note and, as humans do, they will talk about the experience they enjoyed in your community. This is how you grow your community by personal recommendations. It is the best advertising you can get. When your staff learns through good training, to work together as a team, they will wear their B♥ Kind® pins with pride. They will take their new responsibilities to heart and that will overflow to others. This personal attention will also overflow to other areas in your community. When meeting in the hallway or a game room or any other place, your staff will have a personal connection to your resident, their name. When you use a name, you put your best foot forward, create a smile on those you greet and how can life get any better than that?